 In the high-spirited Up my Mother's Flagpole (1974), Zohar characterized her early life as a process of individuation and alienation. 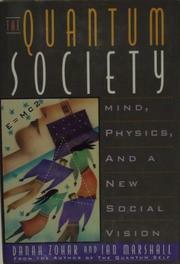 Then, after marrying, she used the metaphors of physics, which she had studied at MIT, to redefine life as relationship (The Quantum Self, 1989). Here, Zohar (Science & Culture/Oxford) and psychiatrist Marshall extend these concepts to a vision of a new vast and inclusive society. Zohar and Marshall challenge the traditional Western dualities of mind and nature, spirit and matter, self and other, by liberally interpreting quantum physics as a theory that explains the fundamental operations of nature or reality as holistic, pluralistic, and integrative. The resemblance between the structure of the universe and the structure of the mind, they claim, enables individuals to conceptualize reality as it is pictured in quantum physics. They want to extend these qualities of the universe, shared with the human mind, as described by quantum physics, to the organization of social life. With charming hand-drawn diagrams and lucid explanations of classical physics, quantum physics, neurobiology and molecular biology, Zohar and Marshall develop models, analogies, and metaphors for the even more elusive ``physics of the mind'' and the ``science of consciousness.'' Their goal is a mutually creative relationship among mind, society, nature, a ``both/and'' form of thought rather than ``either/or,'' psychologies, families, and governments based on the principles of quantum physics, peacefully evolving. However, without concrete examples to illustrate such theories, this quirky work remains abstract and speculative. Zohar and Marshall offer the general reader a better introduction to contemporary science than to social philosophy while stretching the limit of fashionable interdisciplinary discussion.